U.S. Rep. Bruce Poliquin, R-Maine, fields questions from reporters at the Portland International Jetport, Nov. 27, 2018. 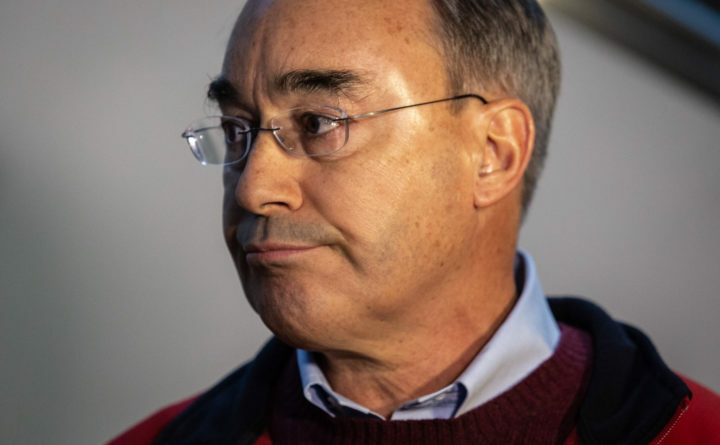 A federal judge on Thursday rejected U.S. Rep. Bruce Poliquin’s argument that ranked-choice voting is unconstitutional and the two-term Republican congressman’s request for a new election. U.S. District Judge Lance Walker also issued a judgment in favor of the Maine Secretary of State’s office, the primary defendant in the case, closing the case in Maine. Now, the Republican’s only immediate hope of reversing the results of the November election he lost to Golden rests on the recount of 2nd Congressional District ballots underway in Augusta overturning the outcome of last month’s election — an unlikely prospect. Walker’s decision marked the second time in a month that the newly appointed judge rejected a challenge from the two-term congressman to the voting method used for the first time in federal races in Maine this year. Walker entirely dismissed Poliquin’s argument that ranked-choice voting proved confusing to voters. The congressman’s legal team had brought in a voting systems expert, University of Maryland political science professor James Gimpel, to make the argument during a hearing earlier this month. “To put it generously, plaintiffs have not demonstrated persuasively that the inferences that they draw from the ballot data are more likely true than false,” Walker wrote in his 30-page decision. “That is, plaintiffs contend that the ballot was too confusing for the average voter of Maine’s Second Congressional District to understand, as evidenced by those ballots in which the voter did not select either Mr. Golden or Mr. Poliquin as their down-ballot choices. Golden said he expected Walker to rule as he did. The congressman-elect said he is not concerned about whether Poliquin will appeal Walker’s decision to a higher court. Golden said his focus will remain on transitioning into Poliquin’s seat Jan. 3. Poliquin’s spokesman, Brendan Conley did not respond to requests for comment. In a statement on Twitter, Poliquin said his challenge to ranked-choice voting was about more than the 2018 election. “Now that Maine voters have experienced the complicated and confusing Rank Voting in a real general election, it’s more important than ever to ensure that every Mainer is able to cast his or her vote legally and fairly,” Poliquin said. Lee Goodman, Poliquin’s lead attorney from Washington, D.C., has said that he would appeal the case to the 1st U.S. Circuit Court of Appeals in Boston and the U.S. Supreme Court, which could take years. In addition to arguing that ranked-choice voting proved confusing, Poliquin’s team argued that the voting method effectively disenfranchised a segment of voters who ranked only one candidate on their ballot. The congressman’s lawyers also contended that ranked-choice voting, endorsed twice by Mainers at the ballot box, violated the U.S. Constitution and the Voting Rights Act. Walker rejected all of those arguments. Golden won the election with 50.53 percent of the vote to Poliquin’s 49.47 percent following the ranked-choice tabulation by the Maine secretary of state’s office. Poliquin had garnered 46.3 percent of first-choice votes on Election Day to Golden’s 45.6 percent. But because no candidate received a majority of those first-choice votes, the ranked-choice voting process kicked in and the votes from those who had chosen independents Tiffany Bond and Will Hoar were reallocated to Golden and Poliquin. Golden claimed more of those reallocated votes, elevating his vote total above Poliquin’s. Poliquin sued Maine Secretary of State Matt Dunlap in U.S. District Court in Bangor last month after the Nov. 6 election, but before the ranked-choice voting tabulation was completed. Along with challenging the constitutionality of the process, he also sought to stop the vote tabulation before it had concluded, a request that Walker denied while allowing Poliquin’s constitutional challenge to proceed. Apart from Poliquin’s legal challenge, the congressman also requested a hand recount of votes on the last day he could, Nov. 26. Dunlap’s office began the recount Dec. 6, the day after last week’s federal court hearing. The count is expected to wrap up before the new year.